I have Evolution Trainer Power System .46 engine that dies when running at full throttle. Well actually, my first problem is that most of time this engine starts in reverse. And my recent problem is that the engine die at full throttle. Matt's Reply: Using an electric starter? Hello Hadi, It is common for an engine to start and run backwards. This happens more often when starting by hand or chicken stick. Are you using an electric starter? If not, I highly recommend purchasing one. If this is happening even with an electric starter, it may be because the engine is flooded with fuel. In other words, it was primed too much. If this is the case, just close the throttle or remove the fuel line and let the engine burn all the fuel out of the engine while running backwards, then try to start it again. It sounds like your high end needle may be set too lean. Once you give it full throttle try the pinch test. If the engine dies right away, it's too lean and you need to open the high speed a bit. If the RPM's rise briefly before the engine quits, then it's too rich and you need to close the high speed need a bit. I have a problem with Pinch test. When i advance the throttle to full, the engine die and i do not have any time for pinch test. Also at the idle time, it is not working good! It has a vibration and i think i should solve this problem first. I'm using an electric starter. Your first post said the engine would run a little while at full throttle before quitting. Now it's quitting right away when you advanced the throttle? Is this a new engine or used? Is the engine vibrating badly at idle, or is the engine just running really rough? Like coughing and sputtering? I would suggest putting both the high speed and low speed needles back to the factory settings. The manual should tell you how. I would also install a new glow plug. If you still can't get her lined out, see if there is a local club in the area. Those guys would be glad to check it out for you. I'm having the same problem with my evolution trainer power system. The engine die when I advance the throttle. I tried to adjust both needle and restart many times, but same result. When I advance the throttle, it seems like there aren't enough fuel going into the engine. I cannot even get the engine to full throttle. Even at half throttle the engine slowly die and stall. It is also hot. This is a new engine. I tried to use a syring and pump fuel into the engine while its running. I advance the throttle and press the syring even harder. Then I advance to full throttle, and I can see fuel coming out of the muffler. but I stop pressing and the engine immediately die. I figure not enough fuel into the engine is my problem. And try to adjust the high and low speed needle, but no result. fuel is still not going into the engine enough for full throttle. so it dies. I need help with the fuel. When you increase the throttle and before your engine going to die, clog the exhaust instantaneously and see whether the engine dies (repeat this process as many times as needed to prevent engine turns off). If when you clog the exhaust engine speed temporarily goes up, there is problem with you fuel pressure line, or even the height of your fuel tank needs adjustment. (I presume that you have followed the manufacturers valve setting recommendations). I have got nearly the same issue. I am running an ABC sc46 on a trainer aircraft but I struggle with the full power. Idle is very stable, it reaches full power very well (good transition) but it cannot remain at full power for more than 2 or 3 seconds. I checked my fuel tank (for fuel line, air pressure), I used 4 different plugs (F5 to F8), I also used different fuel (5% and 16%) and sadly still the same issue. I tried the pinch test but everything checked out OK. Also I see some fuel going out the exhaust. It is like if there is not enough fuel supplying into the engine but now I don't know what else I could do. Please does someone can help me (I spent months on this issue)? Get rid of the EVO, its cheap for a reason. As the saying goes, "you get what you pay for"! By an OS 55AX. Will fit anywhere the EVO46 fits. The OS 55AX will give you trouble free flying and give your airplane a whole new dimension. I've had lots of EVO Engines. .46 .52 .61 and the 100. They are the dead stick kings of engines. They are finicky and unreliable due to loading up. The .52 Im still running is the only decent one of the bunch, but Im still leary of it because of the other EVO's. As far as 2 strokes go. If you want reliability, OS is it. Quality is a bit pricier but reliability is cheaper in the long run. I have the same problem except when the engine dies the fuel drains back into the tank and losses its prime. Had 6 guys at the feild looking at it for 5 hours. checked everything. took it back to the hobby shop. they looked at it and were sure was the fuel lines. they changed them and still same problem. plane is currently at the hobbyshop as they are stummped! I purchased an Evolution 60 NX right after Christmas last year. After an extensive and probably excessive amount of research, due to this being my first RC engine, I feel like I should have had more success with this engine. As far as the power goes, it did everything that I had expected it to do. The strange part was, my high speed needle valve was out 4 3/4 turns, and the engine kept running even faster as I advanced it out farther. But my airplane and myself were getting soaked with fuel and oil. When I had tried to slow it down it just died. Any thoughts? I don't feel like the amount of fuel or oil coming out was "normal". I also shut it down for fear of damaging the engine before messing with any other settings. Soes the fuel start to separate if it gets to cold? I believe it was around -8 degrees C. If so, this may explain the odd running. Also, I'm running omega 15% nitro, 17%castor/synthetic blend. I'm using the stock plug(which will likely be changed very soon). I generally use 10% nitro. Higher nitro will make engine run cooler. I have also been flying with tinfoil around top end of engine but not on the head. High speed should only be out 2 21/2ish turns. The low speed needle is an absolute pain to set. I also changed all carb and needle seals and o-rings. I got rid of 3 blade prop and knocked the flywheel off of the prop driver. Try to keep the 3 blade propeller untill you can land though. The extra blade slows your airplane down quite a bit on landing. 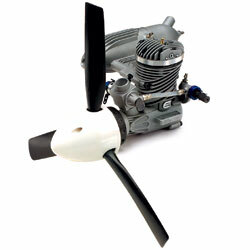 But your airplane will fly much faster with a standard 2 blade prop. As far as the propeller is concerned, I currently have an 11x7 on it and I'm 100% sure that I had hit at very least 13000rpm. This particular engine didn't come with a flywheel. As far as the engine temperature, it was too hot to touch within moments of running. I was holding the exhaust pipe for starting it but had to let go within seconds of it starting up due to heat. I think the lower nitro may be a good starting point. I'm also gonna have a second look at all the fuel lines just to make sure they are connected properly with no leaks. Also, why was it that you felt the O rings and needle valve gaskets needed to be replaced? It may just be best to wait till warmer weather comes around to. I know the way this engine is built, the cylinder is actually tapered towards the top, and since it is really cold outside the parts may be fitting together tighter than intended which may have an adverse effect. I suggest you call Evolution Engines. I called them and I was on hold for a bit but I was able to get the recommended r.p.m. at full throttle and the engine temp at this r.p.m. As for the seals and gaskets I changed. I just had a engine that was doing really strange things. i figured out what was wrong. It wasn't my fuel or plug or anything. My low speed needle was set so far in that it was restricting the overall flow of fuel. This is why the high speed was out so far. It would also sort of run low speed with the high speed needle in where it was supposed to be(approx. 2 turns out) but not both at the same time. I backed the low speed out as far as it would go within its range and now it is working a lot better. It's just a matter of trying to dial it in a bit. No more dieing at high speed or low speed depending on how I set my high speed needle. As far as why there is so much oil coming out, I think I may just need to find a fuel that doesn't have 17% oil. That seems far higher than it should need to be. A glow plug with an idle (splash) bar may help with the engine when it does not remaining running at idle. This was the solution to my Evo 61 trainer engine. Hey guys this site is awesome youve really helped me out here with all of your tips and i am sure to come back and visit in the future. Thanks Sam, I'm glad you found the site helpful! What size engine has an a on the head . All named coments and methods can be used. This eng runs to ritch from 1/4 to 1/2 throttle. Remove the low speed needle stopper and tune the idle mixer. Advance to 1/3 throttle and set the low end needle. Note about 1/2 a turn leaner should do. Bottom this needle and mark it. Remove needle and sand thick end of the needle until it bottoms 1/2 a turn later. Do not damage the thin end of the needle tip! Fuel lines going into gas tank were kinked. Unkinked the lines and all is well again with engine running at higher setting. Engine constantly cut out after pushing the limits past half throttle. Now re-mapped all lines to and from gas tank. Works really well. Tanks a bunch! Same problem,dies, runs on prime only. Problem: piece of crud in the muffler blocking the vent hole used for pressurizing fuel tank, solution: remove crud.Baffle not a problem. Removed purple idle adjuster for easier access to adjusting screw. Startiing from fully closed, opened idle screw 2 turns, high speed 2 and 1/2, start, adjust high speed needle, then idle. Completely changed gas tank and fuel lines. Before replacing all balsa wood and covering I did a trial run to see if that improved anything. The results of the test were excellent. Engine worked beautifully and there were absolutely no more issues with it running past half throttle once new lines were replaced. Used Du-Bro gas tank and junked Sullivan tank.